Anyhow, I had stopped following news about this product a long time ago, but I couldn’t resist when I saw a piece at Business Insider about Jonathan Kaplan, the founder of Flip. (Granted, the product line was shut down under Cisco and not Kaplan’s management.) So anyhow, in case any of you are wondering what Kaplan has been busy with since he and Flip parted ways, this is it: grilled cheese. Yes, that was not a mistake. Kaplan is now investing his time and efforts (and presumably money) into a chain of restaurants specializing in the grilled cheese. 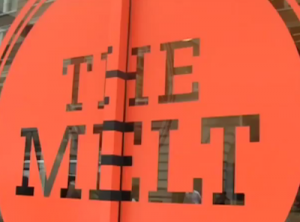 The chain is named The Melt. I kid you not. If you are quick on the draw, you might already see the links between Flip and grilled cheese. If you’re still waking up, just watch this video, which will give you everything you need to work with to figure it out. “Kaplan went with grilled cheeses because he found machines that press and grill a grilled-cheese sandwich in record time, which ensures fast turnover, which improves profitability. The grilled cheese comes with soup because it’s cheap, and easy to store and manufacture. You can order from your iPhone, again, because this improves turnaround time.